Hi, my name is Tony Cove and I would like to welcome you to 1st Step School of Motoring. Consider yourself very lucky, as I could be the person to change your life! "Putting the pieces together ... step by step!" We don't rush you just help you to find your own pace. This means that some people pass with very few lessons and that is fine. Others take longer and that too is fine. We tailor the lessons to suit each individual pupil. Our professional driving tuition is designed for pupils of all ages and abilities. Areas covered from Blaenrhondda to Porth and everywhere inbetween. 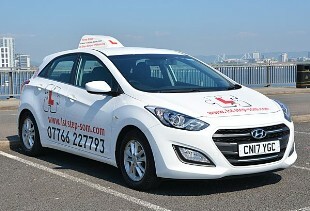 We can also offer a Pass Plus course for drivers who want to brush up on their skills. If you would like any further information or would like to book your lessons with me, then please do not hesitate to call or e-mail and I will respond as soon as possible. I look forward to changing your life! To comply with GDPR please note the following. I ask you for your contact details so that I can get in touch with you to arrange your first lesson and any subsequent lessons. When you get in touch via the contact form I'm presuming consent as otherwise you wouldn't have got in touch. Also I require your licence number in order for me to book your driving test for when you are ready. I will only use the information you provide for the reasons stated and will not share it with anyone else. You will also be asked to give your permission to use your photo after you've passed for publicity purposes. This can be changed or withdrawn at any time. On your first lesson you will asked to sign a consent form which includes the above information. You will be given a duplicate of this form and when you pass your test you will be given the copy to destroy yourself (unless you've been involved in any incidents on your lessons,, in which case I may need to keep it for longer for insurance purposes, after which it will be destroyed.